- Publication of books, studies, proceedings etc. 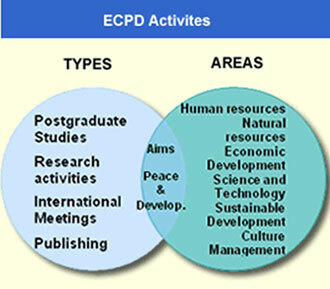 Within the scope of its activities, ECPD has launched and implemented numerous projects, such as: the programs of postgraduate studies, research projects, international scientific and consultative meetings, specialist courses and seminars, published proceedings journals and other publications. Some of the ECPD events were attended by several hundreds of participants, ranging from scientists to ohigh level fficials and public figures from almost all parts of the world. In the future, the European Center for Peace and Development plans to implement its programs of postgraduate studies primarily at university centres in the new states, former Yugoslav republics, in some other countries of the South East Europe and some other European countries. Organizational structure, requesting new associates and heading staff, establishing cooperative environment has been also greatly achieved. Being situated in the very center of an unstable and underdeveloped area, the European Center for Peace and Development makes special efforts in launching and carrying out research projects designed to contribute to the improvement of peace and development of the Balkan countries. The international scientific and other meetings, organized by the ECPD, have proved to be a very useful way of bringing together prominent scientists, experts and public figures from various parts of the world to exchange their views and experiences and to improve their knowledge. Remarkable results accomplished by the ECPD in this field are the best reference and guarantee for its further success in this field of activity. The advanced training and education conducted through specialist schools, courses and/or seminars at the local and/or regional and international levels are another well-marked way leading to the improvement and transfer of knowledge. Based upon its rich experiences, the ECPD continues to organize and carry out these activities intended to improve the performance of managers, researchers and other participants in their professional skills.